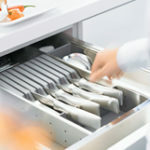 The ORGA-LINE system from Blum is a brilliantly clever high quality inner dividing system for drawers and high fronted pull-outs. 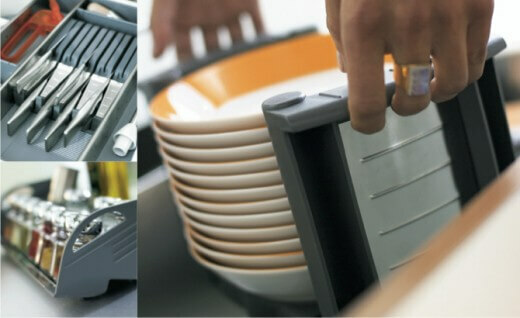 The kitchen accessories make kitchen chores easier and organise interiors. 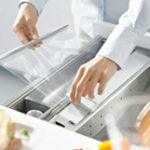 Spice, knife and plate holders and the film and foil dispenser ensure that everything is exactly where it should be. Isn’t it annoying when you roll out your plastic wrap and it gets all stuck together? That’s why Blum developed the tangle-free film dispenser. The secret: The Blum dispenser rod. It gives you a clean edge every time. The dispenser fits nicely into a drawer or can be kept on a worktop. Foil is exactly where it should be and immediately to hand in a foil dispenser. The dispenser fits nicely into a drawer or can be kept on a worktop. 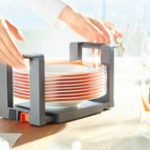 The Blum plate holder can hold up to 12 plates (180 to 320 mm in diameter) and has non-slip feet ensuring that crockery can be safely stacked in pull-outs. 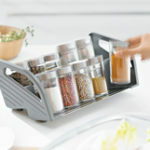 It has two handles so the whole stack can be easily carried to the dining-table or out into the garden. No matter what the size – the ORGA-LINE knife holder keeps up to 9 knives nice and safe. 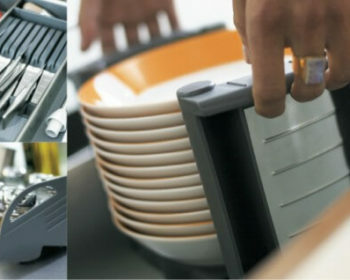 The knife holder fits into a drawer and ensures that the right knife is always to hand. The knife holder is included in the ORGA-LINE set. The ORGA-LINE spice holder securely holds receptacles and packets of all sizes. It can be easily removed from the pull-out and put on the worktop or carried to the dining-table. The spice holder is also designed for dishwasher use. Now that’s practical! 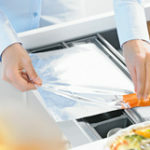 Blum are currently running a FREE monthly prize draw to win an ORGA-LINE box which includes film dispenser, foil dispenser, plate holder, knife holder and spice. 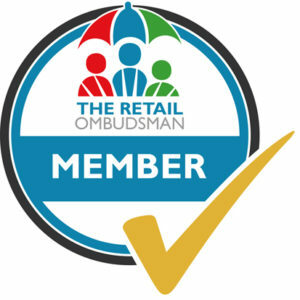 The box is worth £320.00 – simply visit thekitchenthink.co.uk and enter for FREE. At Riggzy complete kitchen solutions we can supply the full Blum range so pop into our showroom to discuss the endless possibilities for your new kitchen or give us a call on 01323 301606.